Simple syrups are a very easy way to add an extra layer of flavor to drinks, cocktails, and even desserts. It’s not just about adding sweetness either. Why add plain sugar to your glass of iced tea when you can add a lemon thyme simple syrup and enjoy a Lemon Thyme Arnold Palmer instead?! 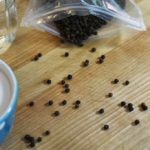 Or in this case you could spice up your favorite margarita recipe with this Black Peppercorn Simple Syrup. A simple syrup is quite literally simple to make. All you do is mix equal parts sugar and water them bring it to a low boil until the sugar dissolves. That’s it! Adding flavor is the fun part. Much like infusions you can make flavor combinations by mixing different fruits, herbs, and spices together. Don’t feel limited by only using plain white sugar either. Honey, agave nectar, molasses, and sorghum work well to. If you want a less-sweet syrup just reduce the ratio from 1:1 sugar to water to 1:2 sugar to water. Be sure to strain your syrups really good. Any particles or matter left in the syrup will cause it to go bad or mold quickly. After straining store in an closed, airtight jar in the refrigerator. Most syrups will keep for up to three months, but some with softer fruits like berries will only last you about two-three weeks! 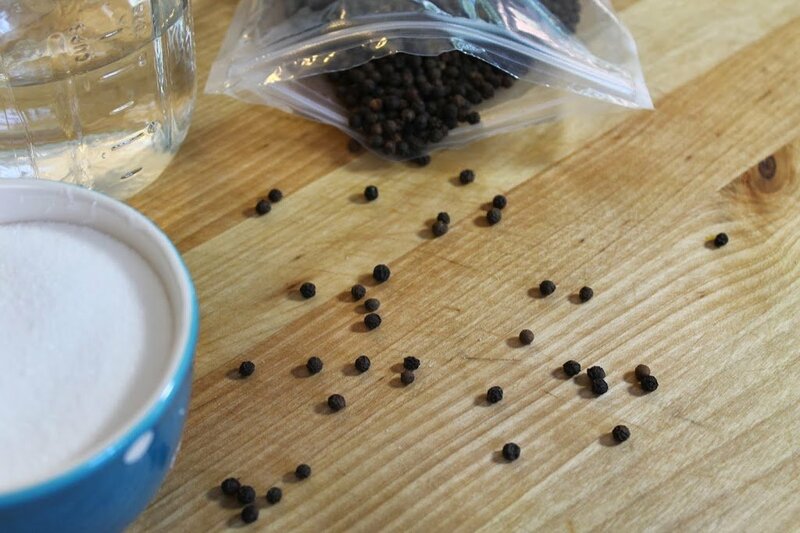 I hope you decide to add this Black Peppercorn Simple Syrup to all your favorite recipes. If you love this delicious idea, you can find more like it by checking out my Beverage section! For recipe inspiration delivered to your inbox, subscribe to my newsletter, follow my photography journey on Instagram, and for generally inappropriate humor follow like me on Facebook! Place ingredients in a medium saucepan. Bring to a low boil. simmer for 5 minutes. Let cool, strain to remove the peppercorns. Store in a closed, air tight container in the refrigerator for up to 3 months.. Tip - The longer you steep ingredients in your simple syrup the more intense the flavor. Taste test after 5 minutes and add time as needed to achieve the desired taste.